I have read some of the earlier posts which recommend "change everything". However, wheel installing the calipers, one of the caliper mounting holes will fit under the fork mounting hole while the other wont fit by about 1mm. Question: am I dreaming? Will the K100 rim ever fit? Or is it a case of use K1100 rims only. Also, when cleaning up slightly rusty fork staunchions, what do you recommend using? I'm thinking 1200 or finer wet and dry and Inox / oil. Use the finest you can get to remove the rust, but it just takes more time and effort. There are heaps of posts on the net on how to remove any pits and scars that can't be removed polishing. Anything from super glue to two part epoxy to a special solder used to repair hydraulic rams. Look up fork pitting repairs and also hydraulic ram repairs. Fitting fork gaiters after will help to maintain the forks condition especially on gravel roads. I don't have gaiters but I pack heavy silicone grease under the dust covers, this helps keep out the crap and lubes them. Change the grease every couple of years, more often in dusty conditions. It will extend the life of your seals. I've done it once or twice and used 1000 grade second cut (painter's "technical term" for rubbing two pieces of 1000 grade wet'n'dry together for a couple of swipes to effectively get 2000 grade). If it slides over the chrome and digs at the rust, you've got it right. It should barely mark the chrome. I then greased that area of the stanchion and slapped a pair of good heavy gaiters on. As long as the pits aren't damaging the oil seals, it's not worth trying to fill them. If they are damaging the seals after rubbing back, my MO is to replace the stanchion at the earliest opportunity. A product called Micromesh might be the answer. It is very fine grade, goes from 1000 in steps to 12,000. It is so fine that we used to use it to polish out scratches on aircraft perspex canopies, and you cannot leave even the slightest scratching on those. Works very well on all plastic, metals ans even rough paintwork. You can turn Aluminium alloy into a mirror with it. 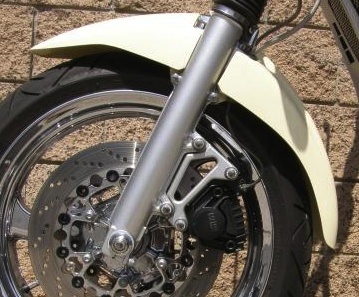 The K1100 rotors are larger (305mm) than the K100 rotors (285mm), so the mounting holes on the K1100 stanchions will be different than those on a K100. You'll probably have to make a calliper adapter to accommodate the difference. Question 1: Michellin Anakee tire - has anybody got an opinion on these? There is one on the rear rim and I guess I will match up to it. I will test fit the rim and tire beforehand. I have just collected some more spares this afternoon and located the correct K1100 spindle (axle) which must be longer than a K100. Question 2: do I need to fit a bigger bore front brake master cylinder to be able to pump to the 4 piston front brakes? I do have access to a K1200 MC and may test fit this. If the parts will fit onto a K100 (85) and they are better then I will try to use them. I am not precious about the bike - it's just a bitsa I am trying to get together and get running. To add to BobT's reply: https://www.sisweb.com/micromesh/. Some of those products do look interesting. 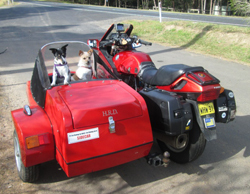 to GF Wollongong (Post 6): I have converted a 1983 K100 (8 valve - see my recent post) to 4 pot Brembo's. Your 8 valve K100 front brake master cylinder (13mm piston diameter) does not generate enough hydraulic pressure to operate 4 pot brakes. The best option is to fit the 20mm piston diameter Magura front brake master cylinder which will give excellent braking. The 16 valve K1100 / K1 and the R1100R have this master cylinder. Unless you are wealthy, buy second hand. The throttle mechanism on the K100 is totally different to that on the K1100, so look for a used unit that has the throttle intact in the 20mm master cylinder unit. You will need to fit a K1100 throttle cable because the K100 cable will not work (be aware that these come in different lengths, so do your measuring first). I ended up having to do modifications to the used K1100 cable I purchased (see my earlier post about this). A key reason for fitting the BMW 20mm Magura brake assembly is that your K100 right hand switch gear fits straight on without any modification. This saves a lot of work and headaches because non-standard master cylinder units will not fit your K100/K1100 switchgear and the necessary rewiring is not s simple task. Finally, a tip about easy fitting of a replacement throttle cable (can be used for fitting other cables). Cables go all over the place in difficult to see and access places. Assuming the cable you are removing is following the correct routing, it is desirable to copy that routing so the cable works efficiently. I tied some fishing braid line of about 40kg weight to the back end of the cable I was taking out then pulled the cable through. Braid is thin, very strong, flexible and slippery so it can follow the twists of the cable as you pull it out. Works brilliantly. ++1 on what redrockmania says above. Tread carefully if you start to rework the front end of the bike. Changing one part of the system (eg. forks or calipers) can quickly lead to the need to change other parts of the system (eg. front master, throttle, etc.) resulting in a series of sequential problems each of which you will need to solve. Solving one could uncover other unforeseen problems that will require their own solutions. It can get daunting. For example, changing the k100 forks for k1100 forks leads you to fit a pair of 4-pot callipers. Fitting callipers will require fitting a larger front master cylinder. Fitting a K1200 master cylinder in place of the k100 master will require changing out the throttle controls. Changing out the throttle controls will require changing the throttle cables and changing the switch gear. Changing the throttle cable will require adapting the new cable to the old throttle bodies. Also, changing the switch gear will require rewiring the electrics. The advice is to research each change carefully before committing to the series of changes, so that you have a plan of attack and a knowledge of the problems you will encounter along the way so as to avoid unsolvable problems. As mentioned in an earlier post, the parts bike cost me a case of beer. (So far...) it has come with at least a ute load of spares ... including cables, K1200 throttle and MC, K1100 forks and brakes, wheels, and plenty of other goodies and less than goodies. So sorting it into my garage has been the first challenge. Still got a K1100 fairing in the drive. Wife is giving the raised eyebrow each time she passes. So I will tread carefully and be mindful of your learned advice. Because the forks and calipers were already on the bike, I am assuming it all worked. It has probably been rear ended at some stage... hence the need to replace the frame. These tires have been around for a while, Anakee 3 is the latest version. It is a dual sport tire though it doesn't look like one, a bit of a joke really at 90% on 10% off road. I know several people running them on BMW R1200 GS's, had a set on mine that lasted Guadalajara to Lima, plenty sticky and no flat spot on the rear, have bought two sets since.